Sheriff's deputies confirmed a mountain lion sighting in Portola Valley Saturday night, according to the San Mateo County Office of Emergency Services. The animal was spotted around 8:30 p.m. Saturday near the 10 block of Coalmine View Road. Deputies said it left the neighborhood heading toward a more rural area, according to the Office of Emergency Services. 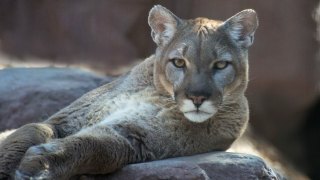 Members of the public are advised not to approach mountain lions in the event of an encounter, especially if they're feeding or with offspring. Joggers and hikers are further advised to avoid outdoor activities between dusk and dawn, when mountain lions are most active.